"FOR SUCCESS, CHOOSE THE BEST!" A HIGHSCHOOL GRADUATE WITH NO EXPERIENCE? WANTS TO TAKE A SHOT IN BPO INDUSTRY BUT FAILS THEIR ASSESMENT AND INTERVIEWS? THEN THIS IS A CHANCE FOR YOUR TO ENTER THE INDUSTRY WITHOUT WORRY! 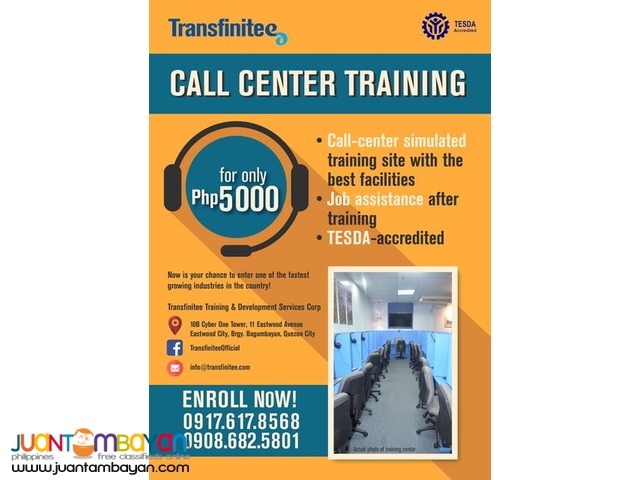 TRANSFINITEE INVITES YOU TO OUR CALL CENTER TRAINING PROGRAM! INVEST NOW FOR YOUR FUTURE CALL CENTER JOB! FOR MORE DETAILS, COMMENT YOUR NAME AND CONTACT NUMBER!